Joanna Penn is known for being an unusually multifaceted author. Not only does she write thriller novels under the name J.F. Penn, she’s also a nonfiction writer, copywriter, teacher, and content creator … and she’s the “chief marketing officer” for her own career. And her marketing superpower? Being able to see the myriad business possibilities that a single book can unlock … even for fiction (which most people mistakenly believe is the least profitable form of writing). Joanna has sold books in 74 countries, as well as created courses, audiobooks, and other profitable models for writers. Business skill … or creativity? Joanna isn’t just a wizard at unlocking business potential with her writing; she’s also implemented a variety of business models that keep her writing business profitable. She teaches what she’s learned to other writers — with practical insights and clear models that writers can use to make a terrific living doing what they love. … then don’t miss her live presentation at the Digital Commerce Summit. Joanna’s session, Creating Intellectual Property Assets: How to Turn One Ebook Into Multiple Streams of Income, will teach you how to turn a single piece of work into multiple streams of income and reach customers around the world. 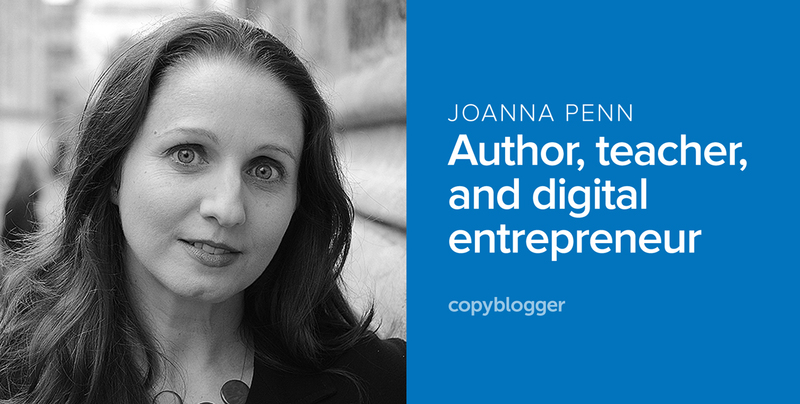 Whether or not ebooks are part of your business model, the lessons Joanna has to teach will apply to every digital business. Join us October 13-14 for a carefully chosen curriculum that will give you the momentum you need to level up as a digital entrepreneur. Joanna is just one of 15 speakers who has walked the walk. Over two days, we’ll teach you how to take your digital project to the next level — or how to get something new off the ground. Click here to get the details and snag the best price on your tickets. I’m definitely interested in hearing more about Joanna’s work. Thank you for the article. Thanks for telling us About Joanna. What an interesting person! I was scooping around and found this post. Personally I believe in creativity. It’s what drives me to do what I do along with passion. It’s what gives me ideas, makes me see what others aren’t doing or what they’re doing but not doing well that I can improve on. That line “I got really annoyed by the fact that I’d wasted 13 years not being creative because people said to me, ‘You can’t make a living out of this.” Yeah right? Heard tons of it especially from My father. But I haven’t given up yet until I make something out of it. Thanks for having her here.. I’ll head over to Rainmaker.fm to consume the rest of the interview. A lot of times, that creative spark is what gives a project (business, side hustle, etc.) that winning difference that makes it succeed. I love folks like Joanna who spread the word that creativity is a vital component of smart business. I would have loved to attend the event…. Although it’s too late for that how about the link to the event.. Can that be available??? So, I absolutely love your website. I try and read as many posts as I can and subscribe to your email marketing and click through on all of your emails. Your content is spot on and completely relevant and useful (I’m slowly working on implementing your techniques now). But, when I don’t have time to read a post, I pin it onto a board where I keep articles for later reading (or even when it’s a post I’ve read and love the content). I’m surprised that your blog images are not optimized with descriptions for Pinterest. I always have to copy and paste the article title under the image before pinning and add “CopyBlogger” so I know it’s one of your posts. For example, this article’s image just says “penn” underneath the pinnable image…just a thought. Thanks so much for your efforts. I can’t say enough how useful your content is. Saeed, thanks for the kind words! We are not able to duplicate the problem you’re having with Pinterest images: they come up with the full post title for us. We’ll let our Support team know and they’ll watch to see if this continues to be an issue. Thanks for letting us know. This is why doing what you love and having a genuine passion for it, is so important for running a business! Of course, you can take advice, but you can’t let people stop you from fufilling you dreams/goals. I’m so glad that Joanna has put her creativity into action, while making a living! She’s great, isn’t she? I love inspirational people who also teach the practicalities! Thanks so much for the article on Joanna, Sonia! It came at the perfect time. I’m currently rethinking my own writing business and launching a new (and hopefully, improved) marketing blitz. I have to confess that I, too, have fallen into the trap of thinking, “you can’t make a living at this,” when the real problem was I just wasn’t approaching my writing as a business. Too bad I will miss her presentation — would love to hear more of Joanna’s ideas. Great stuff! Approaching your writing as a business, IME, makes all the difference. Sorry we won’t see you live, though! Thanks Sonia for introducing Joanna to us. Would love to know more about her and how does she manage all of their business streams. Thanks for introducing this amazing lady! She serves as an inspiration for all of us who are afraid of doing what they love. Great article! Like the others, I can’t wait to hear more about Joanna. I’m a copywriter, a content manager and I try to write fiction in my free time. So, you can make a living from writing, if you work really hard. Are there some tools that help you to make your e-book look better and the writing goes smoother and quicker? This has been one of the best sources of info on writing. Thank you for this super article!